This interview appeared in the German newspaper Die Welt on Saturday 9 June 2018. The interview with Céline Lauer was published in German. You can read the German version here. My (very rough) English translation is below. I was recently profiled in the University of New South Wales’ “20 Rising Stars” series. The piece included a short article and a great photograph of me taken by Quentin Jones. You can see the piece in full here. I was one of the UNSW researchers featured in this series of photographs of “wild researchers” taken by award winning photographer Tamara Dean. The exhibition compiled out of the series was covered by the ABC News online. Further information is available on the dedicated UNSW website. A great interview on Flight Ways has just been posted on the New Books Network seminar. Thanks so much to Carla Nappi for taking the time to read the book and chat with me. You can listen below or visit the page on the NBN website. My interview with Joe Gelonesi forms the second half of this short program on ABC Radio National’s The Philosopher’s Zone. Joe is speaking with Audra Mitchell (University of York) in the first half. 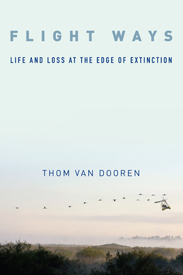 An interview with Simon Worrall about Flight Ways: Life and Loss at the Edge of Extinction for the National Geographic Book Talk Series. An interview with Stuart Campbell on the KZYX Mendocino County Public Broadcasting (CA) program ‘Consider This‘ on Friday 1 August 2014. Extinction is supposed to be forever. But in labs around the world, scientists — using the latest biotechnology — are trying to bring extinct animals back to life. From passenger pigeons to woolly mammoths, Britt Wray delves into the science, the ethics, and the implications of de-extinction for all animals, including us humans. An interview with Natasha Mitchell on the ABC Radio National program ‘Life Matters‘ on Monday 28 April 2014. A short article on my extinction research and the Environmental Humanities group at UNSW by Fiona MacDonald in Uniken, Autumn 2014.